CNN World Sport sits down with the "Special One"
Jose Mourinho took over from Manuel Pellegrini as Real Madrid coach in 2010. If there is one man in the world of football who polarizes opinions, then that man is Jose Mourinho. Ever since running down the touchline at Old Trafford during a memorable UEFA Champions League game for FC Porto, the Portuguese coach has reveled in being in the public eye. Over the years, his brash and bold style on and off the pitch has made him many friends and quite a few enemies as well. Love him or hate him, one thing is clear; you cannot ignore him. And you cannot ignore the fact he is a winner. The 49 year-old has picked up a grand total of 20 trophies with Porto, Chelsea, Internazionale and Real Madrid and he has done it in style. On the way, he shattered records for victories, goals, and press conference attendances. And you can be sure that Mourinho is a gift that will keep on giving. As I prepared to interview “The Special One” or “The Unique One” or whatever you want to call him, it became apparent to me this may be the season he will have to be at his best in order to live up to expectations at Real Madrid. Let’s face it, the campaign at the Bernabeu started poorly which means there is margin for error. Eight points behind Barcelona in the league and competing with three other European heavyweights in the Champions League’s “Group of Death”, every game is a must-win for Jose and Los Blancos. As if there wasn’t enough pressure on the coach’s shoulders, he has also had to deal with a personal crisis affecting his best player. Cristiano Ronaldo sent shockwaves through the world of football when he revealed he was unhappy at Real Madrid. Furthermore, it seems he has a little bit of a dressing room rift to deal with. It is becoming clearer and clearer there is a certain amount of friction in the side between the Spanish players and the foreigners. Why? There are a variety of reasons. According to what I have heard, it seems the Portuguese and South American contingent feel Ronaldo should be more influential in the team and become one of the captains, while the Spanish players think the likes of Alvaro Arbeloa, Raul Albiol and even Sergio Ramos should get more respect. What does this all mean? Well, right now, Mourinho is dealing with quite an explosive situation. The victory over Manchester City diffused some of the tension, but if Real lose to Barcelona in 10 days time; all of the problems will bubble to the surface once again. What you need to realize is that Real Madrid, politically, is one of the toughest teams to manage, especially if you are not Spanish. There are many people in Spain who want to see Mourinho fail and that means every time the team fails to deliver the goods, he is blamed. So can he deliver an elusive 10th European Cup to the Bernabeu? Is Ronaldo going to be happy? How long will he want to stay in Madrid? All questions I will be asking him this week. Send along yours as well if you like. After the interview is done, and it airs on CNN, I am sure people will judge him once more. But hey, he doesn’t seem to mind the attention, does he? If you like football, then, you'll certainly like the excitement that Mourinho adds to it. My name is Sarbesh and I am from Nepal, a South Asian country. I am a big fan of Mr. Mourinho. I believe that he is a great asset for world football today. However, seeing him always makes me think of one question. Its the following " Given the current situation at Real Madrid and the many situations that you have faced in your career, one can easily observe the many controversies and barrage of negativity around you. Why do you think this generally happens to you and how do you prepare yourself to deal with them?" It would be nice if you could ask him this question. My big question is, how on earth does he really always manage to bring majority of his squad player on his side? 'cos i remember his day's at chelsea then, while Cristiano Ronaldo was a man utd player they look like the best enemies in the world to some extent that they throw insult at each other. Fast forward to the present at real madrid they look like they never argue for once before, I dont know how he manage to do that but i drop my hat for him. Mr Mourhino you're the best manager that football ever produce. I love the amount of goal scoring oportunities that real madrid generate. I would ask Mr. Mourinho, while it has been said that Higuain and Benzema are excellent strikers, don't you think that the percent of CLEAR goal scoring oportunities that they miss; well they have to score one out of so many chances, have actually costed too much to the team? Understanding that “Individuals play the games, but teams win championships.” my question is: Do you spend more time on being a Psychologists or trying to enhance your players talent and tactical skills ? My question for Mourinho: if you could turn the clock back to spring 2006, would you still refuse to shake hands with Bryan Robson after the West Brom v. Chelsea match? Without question, Mr. Mourinho is a great coach and motivator, however his ego is so big that it makes him look bad at times. Coaching such an internationally famous players must not be easy, specially dealing with prima donas. 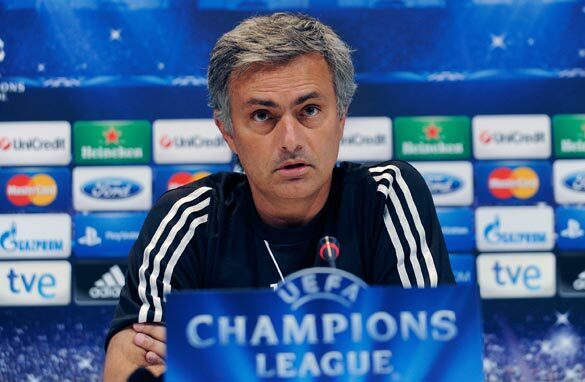 But success is a major accomplishment for Mourinho and Real Madrid is proof of that. Losing a game or two once in a while does not impact a team such as Real Madrid, it teaches them that soccer is a "game", and games are chalenges at all times. I find the control of valuable pitch area, either through possession or without, the most beautiful aspect or football, boxing and chess but most beautiful in football. The use of Michael Essien between midfield and attack to squeeze Manchester City to occupying less than a third of the pitch and, more importantly, little valuable space was a masterclass. Is this the key element of football given equal athleticism, technique and experience on both sides of the pitch? Do you visualize an encounter based on control of valuable pitch area and then count on your squad to follow the plan to control those areas as you have little control over execution of play or finishing? My name is Mirza Hameed and I am from Pakistan. I love football and I love Mourinho since I saw him as a coach with Chelsea. I like his style of coaching and preparing a fighting team on the pitch. I love attacking football even you are winning 5-0 you still keep your momentum and score more. I admire him a lot and wish to see him coaching English team again in near future. I want to help football game grow in my back home country Pakistan. I always tell my friends and youngsters to see Mourinho Team matches and learn how to attach and defend. I would like to ask him, Why he left Chelsea? Would he like to come back to Chelsea if got an offer? What is his next target (team to coach)? Jose old pal. When are you coming back HOME to England. Man U. is waiting for you. Sir Alex has a bottle of your favourite wine at the ready. I am sad to say, my wife loves you, but I say she has no taste, that's why she married me. Ha Ha!!! Pedro here is a good one for you to ask him if you like!!
" Does it feel to you that UK is more in your heart to coach a football team than any other country in Europe and the world for that matter; one can see that mathematically La Liga is lost and next season you will be in England enjoying a Sunday dinner roast?? Hi. I would like to ask Mr. Mourinho the following question: Is there chance to buy new players during the winter transfer window? However, Real Madrid has great players and I think they are strong enough to win both Champions League and Spanish Primera. I have the following question? I am a devoted fan of man united and in the past Mr Mourinho you have hinted on the fact that you would love to take the helm of man u’s manager when the time comes for Sir Alex to retire. Is this still one of your desires or has your position on this changed over time. Since the rivally between barca and real is so huge, the question arise. Would jose like to be once the head coach of barca. Does jose aspiring to become once the coach of Barca? What is his opion of messi.... in terms of football quality compar to ronaldo. I like the only one. Because I like foot ball because of him. His tough and success is very attractive. Ask him, what he think the gap created his team & Barcelona at moment. Ugh CNN, get with the times. He's the "Only One" now. honestly, jose is a leader and a coach per excellence. He accepts blame and does not pass buck. Even when madrid was suffering a string of losses, he was still blaming himself for not motivating the team enough. Morinho adds glamour to football. My Q suggestion is: Why is it Falcao still on the wrong Madrid? I would like to ask him that when will he return to Chelsea ? The one question I would wish he be asked is why he had to poke Tito in the eye..
Senhor Jose Mourinho is still young. He has a long way to go. Trophies and clubs will keep on chasing the Portuguese football manager for years to come. Yes, managing real madrid is tough. I think cr7 should be made as one of the captains, he has leadership qualities, euro 2012 was a perfect example. Keep up pedro pinto, once again a very good article. Your the best. My name is Nishath and huge Real Madrid fan. My question is, Does the current Real Madrid team have enough strikers or do we still need Neymar? If Real Madrid does decide to buy him, how will Ronaldo fair with it? Since clearly both the players intentions are to be the best in the world.